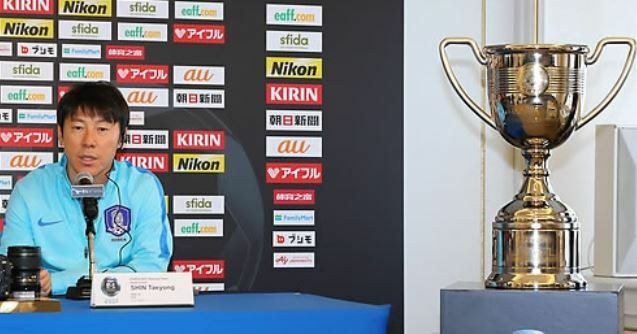 TOKYO -- South Korea football coach Shin Tae-yong on Wednesday said his side is ready to achieve a successful title defense at the upcoming regional tournament. South Korea will compete against Japan, China and North Korea at the East Asian Football Federation E-1 Football Championship. The men's competition will be staged at Ajinomoto Stadium in Tokyo from Saturday to Dec. 16. The E-1 Football Championship, formerly called the East Asian Cup, started in 2003, and this will be its seventh edition. South Korea won three of the first six, with their last title coming in 2015 in Wuhan, China. Japan claimed the trophy only once in 2013, while China won the tournament twice. Shin said he wants South Korea to be the first team to capture two consecutive East Asian football titles. "No team has won this tournament consecutively, but I think South Korea can take a shot this time," Shin said at a press conference in Tokyo. "It's not going to be easy because Japan, China and North Korea are all good teams, but we have a good memory, so we'll go for it." South Korea will open the tournament against China on Saturday and then take on North Korea next Tuesday. Shin's side will wrap up the tournament on Dec. 16 with hosts Japan. Shin will meet all three opponents for the first time as head coach. He took over the team in July after South Korea sacked German tactician Uli Stielike. "I believe all three teams will play good games," he said. "We want to have fair play and show our competitiveness." Among the four nations at the tournament, only South Korea and Japan qualified for the 2018 FIFA World Cup in Russia. South Korea are in Group F with defending champions Germany, Central American heavyweights Mexico and Sweden, which beat football giants Italy in the European qualifying playoffs. Japan are paired with Poland, Senegal and Colombia in Group H.